Dr. Marike Visser, left, a resident in Clinical Pharmacology and PhD student with the Department of Anatomy, Physiology and Pharmacology, is among the 2017 recipients of the Outstanding International Graduate Student Award. She is shown with her resident advisor and graduate mentor Dr. 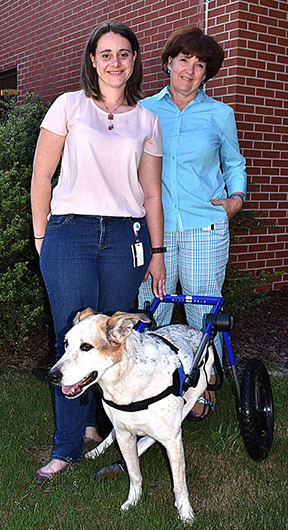 Dawn Boothe, professor of physiology and pharmacology and director of the Clinical Pharmacology Laboratory and her dog, Chay. Chay suffers from Degenerative Myelinopathy. Dr. Visser rescued him from a shelter when he was a puppy and he has journeyed with her from undergraduate years. Dr. Marike Visser, a resident in Clinical Pharmacology and PhD student with the Department of Anatomy, Physiology and Pharmacology at the Auburn University College of Veterinary Medicine, is among the 2017 recipients of the Outstanding International Graduate Student Award. She was nominated by her resident advisor and graduate mentor Dr. Dawn Boothe, professor of physiology and pharmacology and director of the Clinical Pharmacology Laboratory at the college. A native of South Africa, Dr. Visser has lived in the United States, first settling in Massachusetts with her parents at age 13. “My dad was a computer engineer and we moved here for his job and stayed,” Dr. Visser said. Dr. Visser received her bachelor’s degree in Animal Science from the University of Kentucky and her DVM degree from Auburn in 2012. She has completed a specialty residency in Clinical Pharmacology and will complete her PhD next spring. As a researcher specializing in the study of drug interactions and drug reactions, Dr. Visser plans to follow a career in the medical industry. Dr. Visser has authored five peer-reviewed journal articles about her research. She also teaches several veterinary pharmacology courses at Auburn and at Tuskegee University and is active in her community with the Boy and Girl Scouting programs and professionally, as a consultant for the Veterinary Information Network – an on-line medical information sharing source used extensively among the veterinary medicine profession. Dr. Visser also organized CVM’s first Women’s Leadership Workshop, held in October 2016.